Are you a lover of good Italian food? Then be sure you experience dining at Josephine’s Pizza and Pastaria. We serve a classic cuisine known for its rustic simplicity. Josephine’s atmosphere feels like a charming trottoria tucked away in a Tuscan hill town! We take great pride in using the best ingredients to make our specialties from scratch. Delectable antipasto...savory minnestrone soup... hearty calzones...tasty pasta creations...thin crust, double dough, deep pan, or Chicago-style pizzas. And some surprising desserts too! Each Josephine's pizza features our mild, slightly sweet pizza sauce. Our sauce recipe is a closely guarded secret which is only known by our owners, and the active sitting President of the United States - it's that good! Our thin crust pizza is tender, crispy and cooked to perfection. Most people choose our signature thin crust for their pizza, but you can also get most pizzas made with double dough or deep pan. Recently went here and had a pretty good experience. The pan pizza was pretty good. It had a little sweeter sauce and definitely tasty. It probably wouldn't be my top choice in the area but it holds it own. You get garlic rolls with your order and they are fantastic, could eat these all night. Service was very good. Atmosphere is kind of a homey cafe with dimly lit/romantic ambiance. Its not a very large place but the vibe was nice. Prices were reasonable, a large pizza and sodas was about $20. I would definitely go back if ever in Howard. For lunch I went to dine at Josephine's Pasta and Pizzeria, it is located in Howard on the Western border of Green Bay. 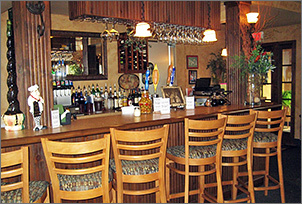 The interior is very charming; there is a cozy small bar in front as you walk in. The windows have black and white checkered cafe curtains, and strung below the ceiling are dried grapevines with tiny clear lights strung throughout the restaurant. Josephine's is tastefully decorated and very clean. They had a luncheon buffet with all you can eat pizza, salad bar, three soups, garlic bread, jumbo stuffed shells, and large seafood lasagna rolls for $6.95. I saw a meatball sandwich with a side of pasta salad on their menu, and since I am partial to meatballs I had to order it. My server was very outgoing and personable and even though it was busy she kept on top of everything. My sandwich was delicious, the bread was toasted with lots of homemade sauce that had a lightly sweet tomato flavor, and the meatballs had a nice texture with just the right seasonings added on top with gooey melted mozzarella cheese. My pasta was mixed with an Italian dressing, sundried tomatoes, and parmesan cheese, it was fresh and tasty. 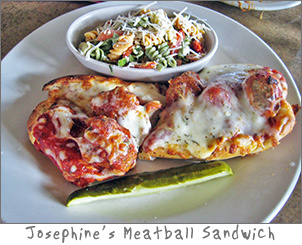 Josephine's cuisine is Italian American with many great choices on their menu.